Summary: When a shocking family secret is revealed, twenty-something journalist Cat Coombs finds herself falling into a dark spiral. Wild, glamorous nights out in London and raging hangovers the next day become her norm, leading to a terrible mistake one night while visiting family in America, on the island of Nantucket. It's a mistake for which she can't forgive herself. When she returns home, she confronts the unavoidable reality of her life and knows it's time to grow up. But she doesn't know if she'll ever be able to earn the forgiveness of the people she hurt. 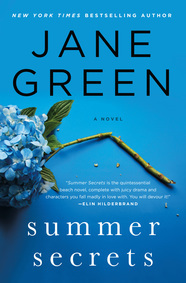 Today is a big day for one of my favorite authors, Jane Green (@Jane Green). She is launching is her new book, SUMMER SECRETS on June 23rd, and I can assure you it's a terrific book. I actually read it last week on my vacation, and I'll be posting my review in the very near future! I am so excited that Ms. Green has offered me the most fantastic summer giveaway for one of you! Truth be told, I'm a little jealous! 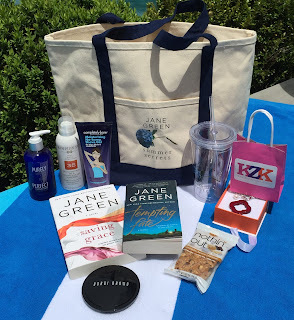 It's a large beach bag filled with Jane's favorite goodies to get you ready for summer! Inside the tote, there is a signed copy of SUMMER SECRETS and an exclusive cold carry cup with the Jane Green Summer Secrets logo! There is a fantastic face and body bronzing duo from @Bobbi Brown Cosmetics, and hair cleansing cream from @Purely Perfect Products that will revolutionize the way you wash your hair - you'll never use shampoo again! Factor 35 continuous mist sunscreen from @Hampton Sun is included, and a beautiful orange glass clover pendant from @KZK Jewelry. There is also a delicious chocolate coconut almond snack bar from @Nothin' But Foods, and a tube of moisturizing no-bump shave gel from @Completely Bare Products! Isn't this a great giveaway? For a chance to win, make sure you like Jane's Facebook page and fill out the form below before June 29th at 11:59 p.m. I will randomly select the winner the following day. This contest is open to those of you with U.S. addresses only. Good luck! Great giveaway. Love the tote bag.